acrylics, honoring excellence, in bed with..., what's in it? OK, now you think this is one big joke but no… they all own the joint… what can a girl do but say the truth? 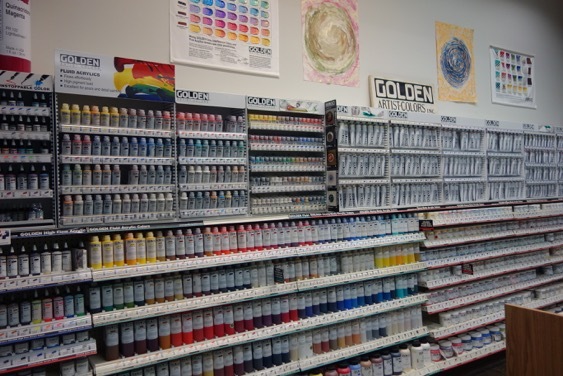 When Mark and Barbara Golden realized a few years back that none of their children had a real interest in taking over Golden Artist Colors, they made the best move you can imagine… and decided to sell it to their employees. The takeover is taking time (the whole process will be completed in a few more years) but since then each and every one of the folks working there are already owners… pretty cool, hey? And one more reason you have to love them, right? But I’ve waxed lyrical enough last time, now let’s dive in the infinity of products they actually make! As I approach the plant that morning, I know that my insatiable curiosity will be feed by the amazing line of people I will meet that day… First a chat with Mark Golden, son of the founder Sam, then a tour of the plant with him, then a meeting with Sarah Sands, head of the complaints department (ops I meant the materials specialist team… that’s all the wonderful people who answer your thousands of anxious questions every year), lunch with everyone, then onto Jim Hayes who’s been head of the lab for 30 years and his accomplice, Ulysses Jackson, who’s been here “only” for ten. I’m determined to leave that evening with a recipe that has eluded me so far. How do you make acrylic paint? I know, it’s a pretty basic question but like Béchamel or Hollandaise sauce I’m convinced there’s an art to it… I’m also aware that could you meet Frédéric Delair, Chef at the famous restaurant La Tour d’Argent, you should ask him about his famous duck in blood sauce dish rather than white sauce but here I am with Jim Hayes, director of the lab (ah ha you even call that in an industrial kitchen don’t you?) and Master-Chef here at Golden asking just that. He seems a bit thrown by my simple request but kindly goes through the steps with me. And of course, unlike Béchamel (read oil paint) which has a respectable history of trial and testing, what they have been trying to achieve here is a sauce that never existed before! Acrylics suitable for artists are not that old and the first true polymer emulsion only goes back to 1953… but we’ve come a long way in these years. Trial and error, formulating, reformulating, adding a touch more of this, less of that, has been quite a process. Paint at first cracked, hardened, moulded, stank and dried but the aim has been the same all along… it’s not about just making a good paint but wanting it to surpass everything else (and of course old fashioned Béchamel) by inventing an exceptional sauce. One that their customers will enjoy and one that will still be around in 5 centuries. Yes, nothing short of posterity is aimed for in this place! Take the chosen quantity of pigment and disperse it in water. Some thirsty pigments will drink the stuff, some hydrophobic ones will need more coaxing… add surfactants (wetting and dispersing agents) in proportion to each pigment’s need and mix thoroughly. Pour the mixture into your Magimix (a coconut crusher will also do the job if you happen to have one!) and add ceramic or steel balls to help break down the clusters of pigment so that now (or later) flocculation of pigments doesn’t happen…… little pockets of pure colour exploding on your canvas are not acceptable but these brilliant guys seem to have a fatal attraction for one another! This operation can be long. Up to a few days in the Magimix or up to 8 passes through the rollers of your pasta machine/triple roll mill (remember to tighten the pressure each time). Add the binder. The pigment dispersion thus obtained is now ready for a last trip in the mill with the addition of the 100% polymer binder that forms and holds the paint film together, giving it its longevity and chemical properties. And in that binder a few very useful chemical ‘spices’ have been added (that’s the secret bit the chefs never really explain. It usually goes something like this… add a pinch of this, a sprinkle of that, a handful of… then taste and accommodate to your taste!) Of course here we’re speaking controlled quantities, still there are so many variables it makes my head spin. Thickening agents will help define the viscosity of your paint. Emulsifiers will prevent them from binding together before the liquid evaporates. Preservatives against bacteria that not only thrive in water but actually like some of the raw ingredients in the binder. These will stop your paint from moulding. Defoamers because the surfactants used for lowering the tension between the water and the pigment at the initial stage (and useful too for the pigment dispersion and the plastic binder to agree with one another in the last stage), do cause one issue in the case of paint… they foam (which is why chemists love them when it comes to making detergent, soap and other bubbly stuff!) Defoamers help to release air bubbles and the foam retained there. Stabilizers are useful too or your paint might become solid rock when it leaves New Berlin in the middle of winter and freezes in the truck and… might stay like that! ASTM* standards require paint to withstand 5 Freeze-Thaw cycles with no loss of quality, hence stabilizers. Rain, shine or worse, properly sealed in its jar or tube, Golden’s acrylic paint should be able to sleep there quite happily for up to 25 years. Which is great because you might not use that colour too often, right? 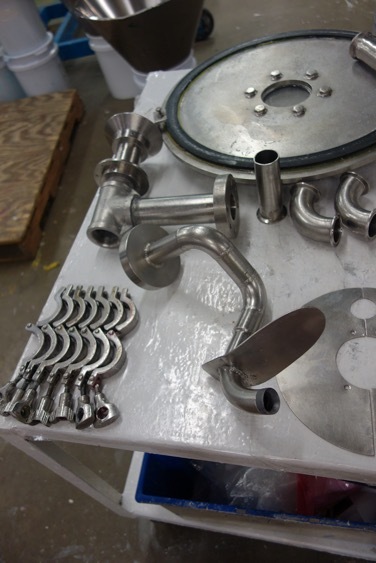 Rheology Modifiers are additives that control the rheological characteristics of the liquid formulation. These give acrylic paint its thixotropic nature…. the property that allows it to be pushed by your brush (and to extend a bit / a lot) then retract to dry and form the film. Retarders are added in some formulas (as in the High Flows or the Open range) to give you more time to play with your paint. And maybe other secret ingredients… I really don’t know. 5. Last step (and I cannot guarantee this process happens in all paint making factories but it does at Golden) is the evacuation chamber (sorry if it sounds a bit sinister). This is a vacuum chamber which rids the paint of any leftover pockets/bubbles of air and the foam contained in them. It’s a tricky stage when you need a film of paint thin enough or it won’t work but, of course, you do not want your paint to dry in the process. My God! That’s it! If you’ve done all of the above perfectly you should get… a deliciously creamy, smooth polymer emulsion! (Emulsion as in a mayonnaise rather than a white sauce in truth.) Personally I’ll stick to mayonnaise-making but if you wanted to give it a go for any reason, start at least from pigment dispersion to which you add the binder of your choice (ready-made with all the additives already in there). If it’s because you want to premix a huge quantity of colour for all the backgrounds in a series of painting… do it! If you wanted a really weird consistency/texture you might want to ask Golden to make the custom product you are after. For some artists they produce only this one colour, for others hundreds of colours. Or a particular viscosity. Sometimes it’s even a really unique gesso… How pedantic can we get! The drawdown test it essential to determine if a batch of paint is consistent in its colour, sheen, clarity, flexibility, drying time with preceding batches and to make sure there are no impurities. That sample will be filed so that if a problem occurs they can take it out and talk with you with the exact same paint as yours in their hand. Pretty cool, hey? But pretty usual too, most companies do that and you should find an obscure batch number somewhere on your tube or tub. What is rarer is to send samples of paint for a “fence test” as Golden does. Literally they will sit out there in the rain, the snow, the polluted atmosphere, the grit of the desert, on a fence at a 45º degree angle to the sun for some time before making the trip back to New Berlin to be tested for resistance, lightfastness, etc. Some other testing can be done in house of course… Typical ones are resistance to solvents (for when you take off that varnish) and adhesion testing by making uniform cuts in the paint and trying to pull it off with a specific adhesive film… the number of squares pulled off will give you an indication of adhesion on that surface because of course you paint on canvas, but also on wood, metal, plastic, found objects and what not. with an informative label, and a hand painted swatch on it too! When Ulysses is not testing this or that, he’s dreaming of new products… “What more tubs on the shelves? ?” I shout virtually in horror… please take pity on us poor retailers who have a hard time understanding what already exists! But it turns out that a lot of what he does is actually testing products to see if they will perform as well or better than existing ones. The whole of the “plastics” industry -usually more concerned about coatings and cosmetics- puts dozens of products on the market and some could offer an improvement on the one used at present…. Then there’s the construction materials, the aggregates -think pumice-, then glass beads or glitter… who knows what might be out there they could use. OMG!!! Ulysses defends himself, saying that everything they have developed was in response to exchanges with artists, from which they came to believe that new ranges or a specific ground for example could really achieve something not previously available. Eventually conservators turned to the renowned master-chefs at Golden to ask them if they might have an interest in developing a range of watersoluble acrylic paint…They had and they did and so, after much testing, you now can find on the shelves this interesting new product unlike anything on the planet… an acrylic watercolour! It’s more vibrant than normal watercolours, hues remain brilliant and, no, not glossy that’s not the word, more present perhaps than in a good quality watercolour…. I’m just wondering now if it’s because they too have a white, milky binder which obviously dries transparent but compensates in the eye for the normal fading of watercolour paints when they sink into the paper…. hmmm interesting, forgot to ask that one. At the time, it was such a new product I had not really had a chance to play with it. I have now and it certainly feels more bodied than the normal washy nature of watercolour. Get a tube, see for yourself if you like it, it’s a slightly different animal but you might enjoy the exciting colour marks it leave on paper. And then finally, sometime between all their Golden acrylic colours and Qor‘s birth, Williamsburg Oils entered their lives! The company existed already and had been created and run by a friend and New York neighbour of the Goldens, Carl Plansky. Carl, a pigment fan, traveled the world in search of the most beautiful raw materials in the world, importing pigments from dozens of countries… and developed the most extensive and superb range of earth and ochres oil colours anywhere (there’s some iridescent and interference colours too!!) After he passed away, his wish came true, and in 2010 Golden took over his company. Their slogan these days is “Oils with an New York attitude”. Cool but… what does that mean? Well it means this time and tested paint was not only incorporated lovingly into the bigger Golden picture, its personnel all brought on board and into the fold but that, as ever, there was no respect for tradition per se, so it was tested and tried by all as if oil paint was this really new thing no one had ever seen before! 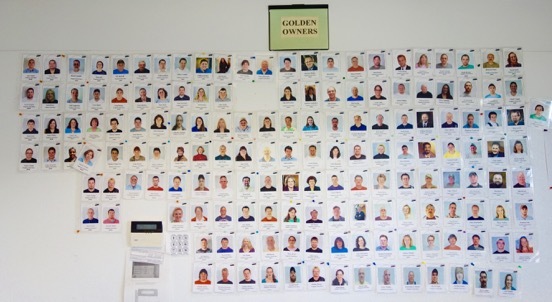 Because… that’s what the Golden team does and does well. Suddenly their newsletter Just Paint was full or articles about “Does oil paint ever dry?”, “Volume, Weight and Pigments to oil ratios” and other fascinating info I had never read before about… oil paint! Voila, if this has not convinced you these folks make paint with a passion equal to yours at painting, I don’t know what will! (Yes, they want to sell it in the end but you too, I imagine, want to sell your artworks…) Isn’t it pleasant though to press a tube of pure dedication on your palette??? PS: Sorry for not giving you the “exact” recipe for acrylics, that’s a trade secret of course but one that Golden shares, yes, but with select conservators in museums to which they give a precise list of all ingredients in a few colours/paints so as to give them a reference point for testing variations… see, they really mean to be around for centuries to come and… who knows? * Sarah Sands has coined it the “Awfully Slow and Tedious Methods” society but ASTM really stands for “American Society for Testing and Materials”! This organization develops / publishes voluntary consensus technical standards for a wide range of materials, products, systems, and services. In the art paint industry, volunteers from reputable and competing brands (Gamblin, Winsor and Newton, Liquitex, Natural Pigments, Blick… Golden) sit together with conservators, scientists and consumers to work for the common good of the industry and agree on standards that should be met for a product sitting on the shelves under the label “gesso” for example. Artists often buy a product like this on price alone and yet it is the very foundation of their artwork! Available gessos are then tested for flexibility and absorbency on a double blind study and twenty nine years and many blind tests later, they agree on what are the basic requirements for such a product… Me thinks you can really trust a product that claims ASTM standards and bares that label! PPS: I have finally finished my Acrylic and Vinyl pages (YIPEE!!! ), so if you wanted more information about Acrylic Paint, Acrylic Gessos and Grounds, Acrylic Pastes, Gels , Mediums and Additives or Varnishes for Acrylic paintings, you know what to do… just click on the words! If you’ve enjoyed reading this… share and like this page. It will be my reward for hours of research! I would also love to build this art materials community… in doing so, I can thank the lovely people who have generously given of their time, opened their labs and factories, given tips and information I can now share with YOU! Fascinating article! I didn’t realise what was required to make a so-called simple colour, but for sure colour is not simple – it is gift of the light. I will not be using these paints without being grateful to the long line of people involved developing beautiful colours for us. Thank you again for a very readable research.